Nostalgia In Miniature Workshops: Alright.......we can improvise!! This week has seen us putting together the kits and instructions for the Workshop on October 23rd - a reprise of 'Over the Little Garden Fence' and 'Down the Little Garden Path' for those who were unable to attend the earlier workshops. In between we've been working on the prototype of our Christmas Special...The Little Old Washing Line' on November 27th...so that we can show you pictures and also bring it to the next workshop. 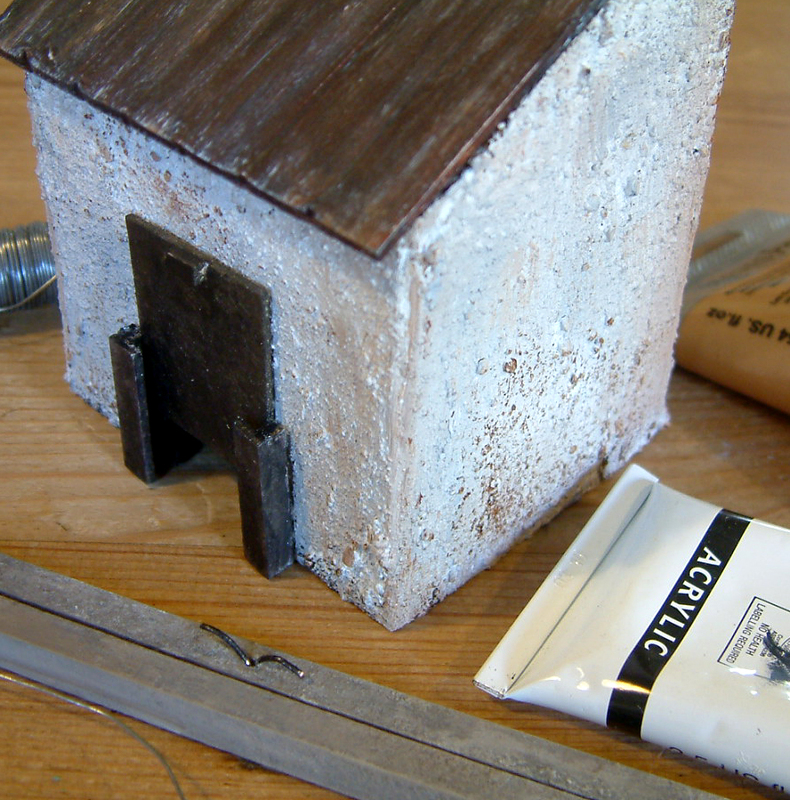 Celia's finished the authentic looking coal bunker pictured in the previous blog....but it does need some coal to spill out! No problem! Somewhere in one of Robin's 'safe places', is a bag of miniature coal. After a week of searching it's nowhere to be found so to Plan B - a lump of real coal smashed to smithereens. Tiny problem - neither of us has a coal fire or knows anyone who does! We briefly consider Plan C - demonstrating a new 'skill' i.e. painting stones black to look like coal and 'stretching it' a bit......"it" being ones imagination!!! A bright spark tells us where the nearest coal merchant is to be found and we decide to visit and beg or if necessary buy, a single lump of coal.... then a friend locates another friend with coal.....and the miniature coal turns up!! Meanwhile - back at the miniature compost heap.....we ran out of the net with exactly the right sized holes for 1/12th chicken wire (actually about three weeks ago). Not a problem as the local fabric/haberdasher/craft supplies shop always keeps it in stock. Only they didn't! A variety of other obvious outlets and four charity shops were also bereft of net and then.....with desperation mounting, finally a child's fishing net in a fetching shade of day-glo green, was spotted in another local shop - Phew!! A bit of unpicking (and a stylish green stake for the garden) and a liberal spray outside with a can of silver paint (it would have to be on the windiest day of the week) and we have our chicken wire and the compost bins will now be perfect!! !